2" NOMAD aluminum body / PTFE diaphragms, balls, aluminum seats 1 @ $1800.00/ea. 1" Price/TABLA aluminum body / PTFE diaphragms, balls, alum seats 2 @ $650.00/ea. 1/2" Polypropylene body / PTFE diaphragms, balls, poly seats 2 @ $450.00/ea. 1-1/2" sandpiper HDB CAST IRON body / BUNA diaphragms , balls, seats. 2 @ 2000.00/ea. Check out Rebound Products latest sales promotion! Partes de repuesto "ReBound" para OEM | View our Break away from the OEM article. We are distributors of OEM and after-market parts for AODD pumps made by Wilden�, Warren Rupp�, ARO�, Viking� and Versa-Matic�. We offer these replacement pump parts from our stock in Houston, Texas at considerable discounts from the OEM list price. We are looking for customers who are interested in saving large amounts of money on the maintenance, repair, and operation of their manufacturing equipment. We will be happy to fill your order with individual parts or a complete "wetted end" kit. For information on price and availability, please call us at the numbers provided. We are now accepting Visa & American Express! 2" ARO PTFE diaphragm part number 94355-T � off OEM list. ARO OEM charges $175.00/ea. | Rebound resells same for $87.50/EA. All specials good while supplies last. Rebound offers all sizes of ARO PTFE diaphragms. From �� to 3�, Rebound carries stock on ARO. 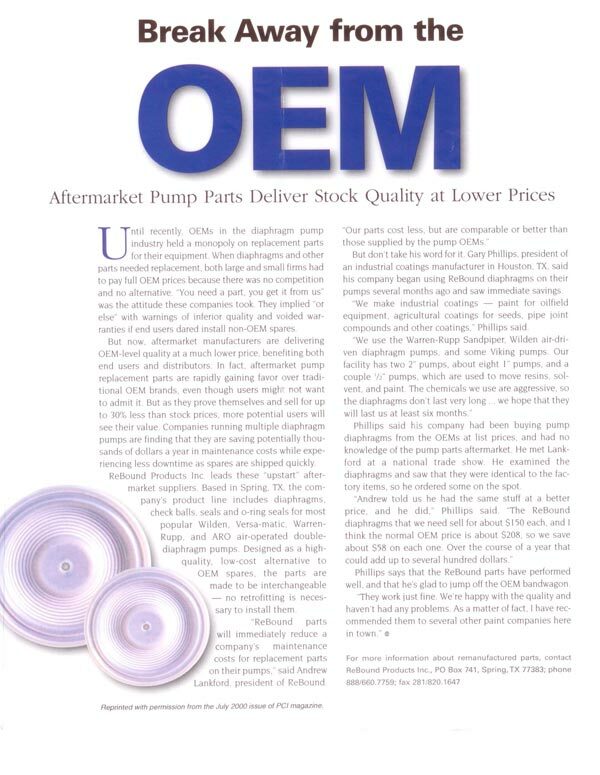 In the recent years, ARO has improved on the design of their larger pump diaphragms. The 2� diaphragm takes the shape of an octagon. Wilden has been the market leader in air operated double diaphragm pumps. Wilden is deeply committed to the pursuit of excellence, customer satisfaction, research & development and market knowledge. 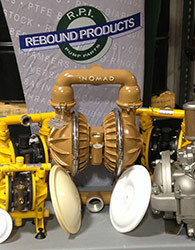 Rebound has a full complement of PTFE diaphragms to fit the Sandpiper line of Warren Rupp pump. When we say full complement, we mean PTFE diaphragms that fit all sizes of pump. from �� to 4� Rebound Products has it. Rebound continues to excel in the design and manufacture or PTFE pump diaphragms with its complete line of Yamada Pump diaphragms. The 2� and 3� Yamada diaphragms are not offered by everyone the aftermarket. 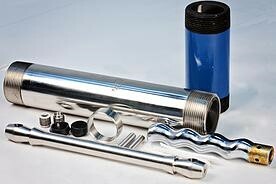 Rebound Products, Inc. offer a wide range of Viking Pump Parts. Ranging from part numbers 2-116-006-880-00 to 3-572-352-012-00 including carbon graphite, bronze, vellumoid and hardened steel materials. We carry the complete line of Sureflow Air Operated Diaphragm Pumps. These pumps are available in 1-1/2", 2" and 3" sizes. © Rebound Products, all rights reserved. Powered by EngNet.